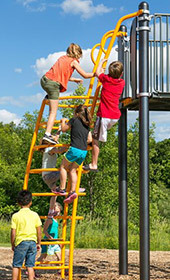 We are excited to introduce five new PlayBooster® climbers to ascend from the ground up to 96” (2,44 m) decks! 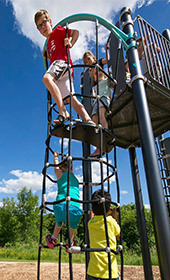 These towering climbers provide kids with thrilling new challenges in climbing. Now they can go up, up, up while also discovering innovative ways to go across, through, under and over. • Arcade Climber – a series of arches soars up to an eight-foot deck. Handrails offer guidance as kids travel up and down. The black belting step at the six-foot height invites players to gather or rest between climbs. 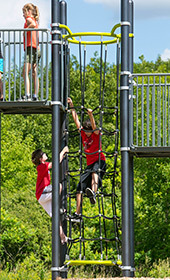 • Chimney Climb Across – rugged cable matrix allows kids to climb from the ground up, exploring inside and outside as they travel between two decks. Sparks imaginative fun along with rambunctious activity. • Chimney Climber – climber encourages up, down, in, out and over and under fun all the way up to eight feet. The small GripX platform at the six-foot height provides a great resting place. • Dot-to-Dot Climber – follow the dots that wind their way up to an eight-foot deck. Handrails offer easy grips on the way up and down. GripX steps provide sure footing. 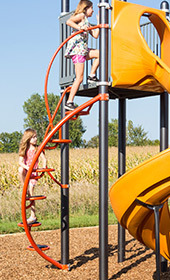 • Shockwave Climber – Concentric circles and semicircles challenge climbers to find new ways – inside and outside – up to an eight-foot deck. Three small platforms of black belting provide convenient resting places along the way. Landscape Structures has a great new brochure, ELEV8 that highlights these five climbers along with ways to slide down from 96” decks from the new WhooshWinder Slide and 8’ Double Swoosh Slide! 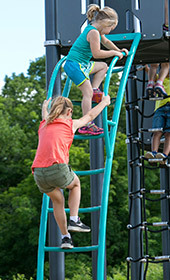 Click here to request more information on the new PlayBooster® climbers!